Cindy is headed out on an extended vacation until April. The Charlotte, Michigan location will be filling in until then. Too Cool T-shirt Quilts® - Florence is located in Florence, Oregon. Owned by Cindy Russell, she provides an extremely experienced creative approach to Too Cool T-shirt Quilts®. Sewing and quilting have been life-long passions for Cindy. As soon as Cindy was able to reach and use a sewing machine, she was making clothes for her dolls. Then while pregnant with her first child in the early 1970's, Cindy made her first quilt. Taught by an old school quilter from West Virginia, Cindy learned classic hand quilting. Her teacher told her that "a quilt was no longer a quilt if touched by a machine." Over the years, of course, Cindy easily moved to making quilts with machines. In 2008, while looking for a greater creative outlet from her every day detail oriented work as a nurse, Cindy began her own quilting business, Angel Heart Quilting & Things. Then inspired by a quilting seminar and a friend's excitement over a gifted T-shirt quilt, Cindy desired to expand her quilting business to include T-shirt quilts. After searching T-shirt quilts, Cindy found that Too Cool T-shirt Quilts represented the exact combination of detailed sewing precision and artistic quilting she enjoyed. 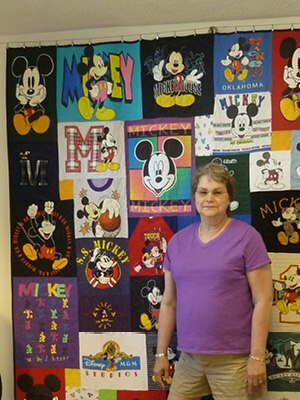 Now as owner of Too Cool T-shirt Quilts® -Florence, Cindy uses her lifetime of experience and the Too Cool T-shirt Quilt® method to provide customers with quality Too Cool T-shirt Quilts®.